There are only 40 or so "common" skills in the game. These skills are available to all characters, regardless of Race or Profession. All skills have specific aspects which govern how they can be used in the game. Skills are organized by categories based on their usage and the attribute they are tied to. Attributes are used to reset your skills. This table shows the skills aligned by their respective attributes. Those skills marked with an asterisk(*) may be purchased multiple times. Each purchase either increases the power of the skill or adds to the number of uses per Reset. These kinds of skills are called stacked, leveled or charged skills. Costs for some stacked skills increment by 1 for every 10 levels purchased. Current costs for skills are displayed next to the skill name. All skills may be refined and other skills may become available to players. Costs may also be further refined after playtests and are subject to change. These skills are not governed by any Attribute. As you move through combat you are using energy and strength. Power skills which use Stamina are stacked, meaning you may learn to use them with more power or greater frequency by purchasing the skill more than once. These types of skills are useable once for each time you purchase them and their uses may be Reset by using a point of Stamina. Each time you rest and use a point of Stamina, all of your charged or stacked skills Reset. Essentially, your Stamina determines how many times you can Reset these skills during an event. Other Stamina skills may be either leveled or only learned once. These types of skills have a predefined number of uses or are constantly active and do not Reset when Resetting with Stamina. Resetting with a point of Stamina requires a minute of roleplaying. So, for example, Carn the Crusher has five(5) points of Stamina. This means he can use all his skills which rely on Stamina then rest for a minute to reset them all, using a point of Stamina, five times during each event. + This skill cost increments by 1 every 10 Levels. As you move through combat or sneak up on your enemy, you are utilizing balance and agility as well as Stealth to accomplish these actions. Your Stealth is a pool of points based on your Agility. If your Agility is Level 3, then you have three Stealth points. Using a skill which requires Stealth uses these points. You may Reset your Stealth pool by expending a point of Agility. This does not decrease your pool amount, it is merely a counter for how many times you may Reset your pool. Thus, a Level 3 Agility would allow you to Reset your three Stealth pool points 3 times per Event. Unlike Stamina, using Agility to Reset your Stealth pool happens immediately and requires no timed action or roleplay. Using Agility to reset your Stealth also resets your stacked Agility skills. † These skills require Stealth points to activate. Magic is exceedingly diverse in nature. Spells are cast by using one of the three functions of magic; spell slots, magic pool, and focus. Eventually, you may learn multiple ways of harnessing the magic of a spell, but all casters must begin by learning how to cast magic from spell slots. 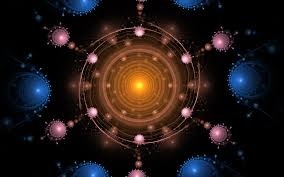 Spells are learned by allocating an area of your mind to understanding how the magic of that spell works. Thus, you create slots in your mind for each spell you learn. Once you have come to understand how the powers of a particular class of spell function, you may call upon that power once for every slot you have allocated. In this way, you may cast any spell you have learned of the same circle with that slot. Spells of the first circle are Class 1. You may learn as many of these slots as you can without limit. Some magic users spend a lifetime only using Class 1 spells. Spells of the second circle are Class 2. Because of the nature of the power of magic, the higher a class of spell is, the more unstable it becomes. This means more temper and focus is required in order to allocate them to your memory slots. You may only stack slots up to a degree equivalent to your base. What this means is, if your base slots of Class 1 spells were three, you could learn up to three slots for Class 2 and Class 3 spells. Once you reach the limits of the degree of your base, you must reduce the next Class of slots by 1. This is the new degree on which you may stack. Continuing with the previous example, you could still learn Class 4 spells, but you would be limited to only learning two. Thus, you could also learn two Class 5 spells, but then you would be limited to learning only one Class 6 spell. As such, spell slots are learned in a pyramid type fashion. The below diagram shows an example of this pyramid mechanic. In this example, the caster has memorized three Class 1 spells and one Class 6 spell. This would be written out as slots under each Class as shown below. This also means he has a total of 14 spell slots. Now, you may decide to only learn up to a certain class or learn your slots in a square fashion. This would be mean only having as many slots as your base up to the limit of that degree. One example would be having four Class 1 spell slots and four in each Class all the way up to Class 4. This would also make your number of slots total 16. Another strange interworking of magic and the way slots can be used or learned is that the slots between adjacent Classes cannot exceed the value of the lesser Class. This means you couldn't have three Class 2 spell slots without learning at least one Class 3 slot. If you had three Class 2 slots and zero Class 3 slots, the difference would be 3 which is greater than the lesser Class (2). Similarly, you couldn't have eight Class 4 slots without having at least four Class 5 slots. An extreme utility of this rule would be the following example. The caster in this example has 55 spell slots, but no adjacent Class has a slot difference of more than the lowest Class. The number of slots is also important because it is used to determine your magic pool. Casting from a pool of magic is known as Channeling. Your magic Pool is created when you meditate in order to link all your memory slots together and channel them into a pool of magic. Many users of magic call this magic pool Mana. When you spend a full two minutes meditating, your spell slots become your Mana. How much Mana you have is equivalent to two times your total number of slots. So, a caster with 14 spell slots, like the one from our first example above would have 28 Mana. The way Mana is used to cast spells is very unique. A spell costs its Class in Mana to cast. i.e. a Class 3 spell costs three Mana to cast. This would mean the caster with 28 Mana could cast seven Class 4 spells before he ran out of Mana. Those of you doing the math now see that even though the caster from the example has only one Class 6 spell slot, he could essentially cast four of them if he were casting from his Pool instead of from spell slots. The other boundary of magic when using Mana is that you must have at least one spell slot in the spell Class you are trying to cast. i.e. If you do not have a Class 6 spell slot, you cannot cast a Class 6 spell from Mana. There are also some spells in magic which cannot be channeled with Mana. The other distinct advantage of having a magic pool is that Professions are able to harness that magic as raw healing or raw damage. Some casters may spend one Mana to heal 1 point of Vitality, as well as some casters may also spend one Mana to throw 1 point of magic damage. In some cases, the damage or healing may also be augmented by some abilities. Some casters become so adept at traversing the slots in their mind and their knowledge of a particular spell that they can access it with little to no preparation. Being able to focus on a specific spell allows you immense access to it. A Focus is created when you meditate to funnel all of your spell slots into a few specific spells. Your Focus points are equivalent to half the number of spell slots you have rounded down. Taking from the same example above, the caster with 14 spell slots would have 7 Focus points. In the same way that you spend Mana, a spell costs its Class in Focus points in order to commit it to memory. Using the example again, this caster could spend his 7 Focus points to memorize a Class 6 and a Class 1 spell. Once you have chosen the spells you are focusing, during your meditation, you cannot change those spells without meditating again. At the end of your meditation, you Imbue yourself with the spells you have chosen to Focus, “Imbue Focused <spell name>.” Once it has been committed to memory, by using the appropriate amount of Focus, you may cast that spell as many times as you want for as long as it stays focused. Yes, that’s what I said, you may cast the spell indefinitely. There are, of course, other factors which may interfere with your ability to cast. When you take damage or are struck by a negative effect, it is difficult to maintain Focus and you must spend three seconds regaining it. You only have a few seconds after taking damage to regain your Focus. If you are silenced, knocked unconscious, fall unstable or are otherwise subdued while focusing, you will lose your Focus and must meditate to either regain it or change mediums. Taking effect from an Infliction immediately ends your Focus. Focusing spells is restricted to your known spells, the spells in a Class in which you have spells slots. i.e. If you have not learned a Class 6 spell slot, you cannot Focus cast a Class 6 spell. There are also some spells in magic which, due to their intricate nature, cannot be focused. Players can switch between their spell casting mediums through meditation. This costs 1 point of Arcane. Each time a caster meditates he also refreshes his form meaning he regains his slots, pool or focus. e.g. Our caster has 28 Mana and casts all the spells he can until he runs out of Mana. He then meditates for two minutes spending a point of Arcane to either change forms or refresh his pool of Mana. In Focused form, you must meditate in order to change the spells you have focused. If you are interrupted while meditating, you do not refresh or change forms, neither do you use a point of Arcane. You must start over and meditate the full two minutes to gain the effect. These are spells listed under the General School of Magic and they are available to be learned by all casters of magic. Other special spells are located under different Schools of Magic which you gain automatic access to by training in various Professions. Armor	 1	 Vestment	 "I bestow upon you the gift of Armor." Blessing	 1	 Vestment	 "I bestow upon you the gift of a Blessing." Detect Magic	 1	 Arcane	 "I call upon the power of Arcane to Detect Magic." Light	 1	 Arcane	 "I call upon the power of Arcane to create a Light." Magic Key	 1	 Arcane	 "I call upon the power of Arcane to create a Magic Key." Root	 1	 Force	 "With Arcane Force I Bind your foot." Repel	 1	 Force	 "With Arcane Force I Repel you." Weakness	 1	 Curse	 "I invoke a Curse of Weakness upon you." Disease	 2	 Curse	 "I invoke a Curse of Disease upon you." Heal Wounds	 2	 Healing	 "By the hand of grace, I Heal Wounds." Magic Arrow	 2	 Arcane	 "I call upon the power of Arcane to summon a Magic Arrow." Magic Blade	 2	 Vestment	 "I bestow upon you the gift of a Magic Blade." Purify	 2	 Healing	 "By the hand of grace, I Remove your Curse." Shun	 2	 Command	 "By my Command, Shun me." Weapon Shield	 2	 Shield	 "I bestow upon you a Weapon Shield." Awaken	 3	 Command	 "By my Command, Awaken." Disarm	 3	 Force	 "With Arcane Force I Disarm your <target>." Greater Armor	 3	 Vestment	 "I bestow upon you the gift of Greater Armor." Greater Blessing 3	 Vestment	 "I bestow upon you the gift of Greater Blessing." Magic Lock	 3	 Arcane	 "I call upon the power of Arcane to create a Magic Lock." Release	 3	 Force	 "With Arcane Force I Release you." Taint (Slow)	 3	 Curse	 "I invoke a Curse of Slow upon you." Web	 3	 Force	 "With Arcane Force I Bind your body." Charm	 4	 Command	 "By my Command, Charm." Destroy	 4	 Force	 "With Arcane Force I Destroy your <target>." Heal Critical Wounds 4	 Healing	 "By the hand of grace, I Heal Critical Wounds." Magic Bolt	 4	 Arcane	 "I call upon the power of Arcane to summon a Magic Bolt." Magic Shield	 4	 Shield	 "I bestow upon you a Magic shield." Magic Wall	 4	 Force	 "I call upon the power of Arcane to create a Magic Wall." Dispel	 5	 Arcane	 "I call upon the power of Arcane to Dispel Magic." Magic Circle	 5	 Arcane	 "I call upon the power of Arcane to create a Magic Circle." Paralyze	 5	 Curse	 "I invoke a Curse of Paralysis upon you." Refit Armor	 5	 Force	 "With Arcane Force, I Refit this Armor." Sleep	 5	 Command	 "By my Command, Sleep." Banish	 6	 Command	 "By my Command, I Banish you." Magic Storm	 6	 Arcane	 "I call upon the power of Arcane to summon a Magic Storm." Reflect	 6	 Arcane	 "I call upon the power of Arcane to Reflect <effect>." Regenerate	 6	 Healing	 "By the hand of grace, may your wounds begin to heal." There are some abilities which may change the way you can deliver a spell. That change also mean you would change the way a spell is incanted. This is to allow others to recognize the way in which you are using magic. For example, the Paralysis spell has a normal incant of "I invoke a Curse of Paralysis upon you," and lasts for 1 minute. However, if a spell caster had the ability to augment this effect to last for 5 minutes, they would use the "Major" augment within the incantation. "I invoke a Major Curse of Paralysis upon you." Ritual Magic, using the Advanced Magic skill, is a higher level of magic in the world and involves a complex combination of components and formulas. Since the earliest you can learn the Advanced Magic skill would be after you've reached 50 CP, you don't necessarily need to learn how any of this works when creating your character. This chapter discusses some of the more rudimentary aspects of ritual casting, but is in no way a complete registry of their function and capacity within the game. There are five different classifications of components; Elements, Natures, Spirits, Arcane and Other. Elements are any component which may represent or act as one of the four Elements; Earth(E), Air(A), Fire(F) and Water(W). Some examples would be a root from a citrus tree, a feather, piece of charcoal or a vial of spring water. Natures(N) are any components found in nature; i.e. a mushroom, insect, sap, snakeskin, etc. Spirits(S) are any components linked to the spirit Plane or imbued with spiritual properties usually contained in vials, crystals, gems or other conduits common for spirits; Essence of a Vampire, Blood from a tortured soul, etc. Arcane(M), sometimes called Magical, components are usually items, artifacts or natural components imbued with some kind of magical property or endowment; Vial of King’s Blood, 100 year old sap, baby dragon scale, Horn of Vordraan, etc. Some components may act as more than one type. For example, a root from a citrus tree could be used in a ritual as either an Element: Earth or a Nature. There are also some components which may be classified as Other(O) or if they have yet to be classified at all may be Unknown(U). In Ritual Magic, a Base often refers to the minimum or standard requirement to perform a ritual. In regards to components it is the basic set of components required for the specific ritual type. This is depicted under the ritual Designs below in brackets. For example, [E, A, F, W, 2N, M] would mean that the Base components for that ritual Design are 1 of each Element, 2 Natures and 1 Arcane component. Most Designs will specify additional required components based on the particular version of the ritual being cast. A lower case ‘e’ means any of the four Elements may be used. Usually, when an Unknown or Other component is required, it is specified in the ritual design by name. Rituals come from an old time and their language is specific. Though the common tongue can be used in reference, any time a part of a ritual references its own Design, it is generally done using the old languages. This is why it’s important to learn the native terminology of Forms and Sets. The basic shapes drawn and used in rituals are called Forms. They are used to contain, focus, harness, channel and sometimes disperse the magics and components used in a ritual. Components are also called Ingredients (Additamenti). The target of a ritual or the item which the ritual is being cast upon is called a Bourne (Poti). A square is known as a Platform (Rostra). Most rituals which incorporate the four elements require a Platform. Platforms are also sometimes necessary in rituals requiring a conduit, barrier and can sometimes act as a protected or removed area. A circle is called a Compass (Declinatus). Its base function is to access and incorporate the components (Additamenti) used during the evocation. It can serve other purposes in a ritual as well. A triangle is the Index (Spiculum). The Index is the focal point or rather, used to direct the magics being used to the target. Usually Isosceles, the top of the Index is called the point and the bottom is the base whose ends are called corners. The Bourne is commonly placed within an Index. Areas within and without the forms are referred to as Exterior (Forinsecus) and Interior (Penitus). A floating Form is one that is not in contact with any other form. A resting Form is one that touches another form but does not overlap it. The Forms in the below example are all resting. Directions can be extremely important when casting ritual magic. North and South reference the top and bottom of a Form where East and West mean right and left, respectively. Positional words like raised and sunken refer to locations relative to North and South. In the few cases with rituals where Forms overlap, the Forms are called Aberrant. Shown below is a True Triadic Set used in performing a ritual on a staff placed in the center. The configuration and use of Forms in a ritual are called the Set. A Triadic Set uses all three Forms. 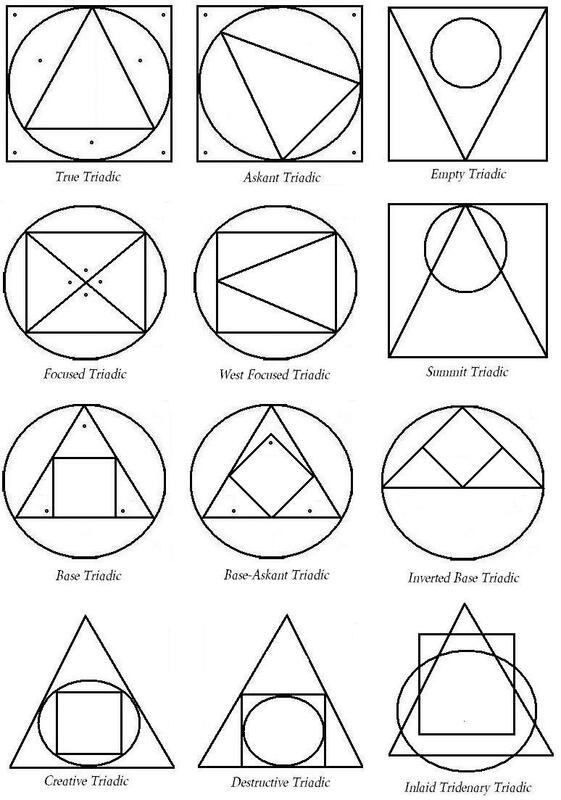 There are seven common Triadic Sets which are contrived from the outermost Form, the Prime, to the innermost, the Focus, where no Forms are Aberrant (overlapping). The form between the Prime and the Focus is called the Medium. These are also known as Natural Sets. Forms are usually drawn and described as being created from the outside in, Prime to Focus. True Triadic - A Platform, a Compass resting on all four sides of the Platform, an Index with the point resting to the north side of the Platform and corners directed at the opposing south corners of the Platform. Askant Triadic - Same as a True Set but with the Index point directed towards a specific corner of the Platform based on the Element in that corner. Empty Triadic - A Platform, an inverted resting Index and a floating Compass centered. Focused Triadic - A Compass, a resting Platform, four resting Indexes all pointing center. This divides the Platform into triangular quadrants. This Set is sometimes drawn with a single resting Index pointing east or west depending on the ritual requirement. This is known as direction Focused, such as West-Focused or East-Focused. Base Triadic - A Compass, a resting Index with a resting Platform centered. There are rare rituals which have the Platform only resting on three points as opposed to an entire side. This is sometimes called a Base-Askant Triadic. A Half-Base Triadic is when the point of the Index is ninety degrees and the Platform is resting on two sides. Because of the angle, in this type of Set the Index only covers half of the Compass. Creative Triadic - An Index with a resting Compass centered and a resting Platform centered. This is sometimes called the Creation Set. Destructive Triadic - An Index with a base resting Platform and a resting Compass. There are two other special purpose Triadic Sets which are sometimes called Unnatural Sets because the Forms overlap. Summit Triadic - A Platform with an Index resting and a Compass overlaying the Index point. The Compass should only be resting at the point. There are many other ways to draw Sets and some use the Forms more than once, like the Focused Triadic which uses four Indexes. Here are the examples of how to properly draw the aforementioned Triadic Sets. A Dual Set uses two Forms. Again, the common Sets are Natural, having no overlapping Forms. The exterior Form is the Prime and the interior is the Focus. There is no Medium Form with Dual Sets. Instead, any reference to Medium infers the empty spaces existing Interior to the Prime but Exterior to the Focus. Dual Sets are named by the Prime and how the Focus is arranged. All Natural Dual Sets are assumed ‘resting’ unless otherwise denoted. Any Dual Set may be referred to with the prefix ‘floating’ to infer that the Focus is not resting. A Platform as a Focus denotes an Elemental Set. An Index as the Focus is called a Focused Set. When a Compass is the Focus, the Set is the Prime. Focused Platform Set - This is a Platform with an Index point north. If the Index points a different direction then it is a direction Platform Set just like the naming convention of a Focused Triadic. An Inverted Platform has the Index point south. 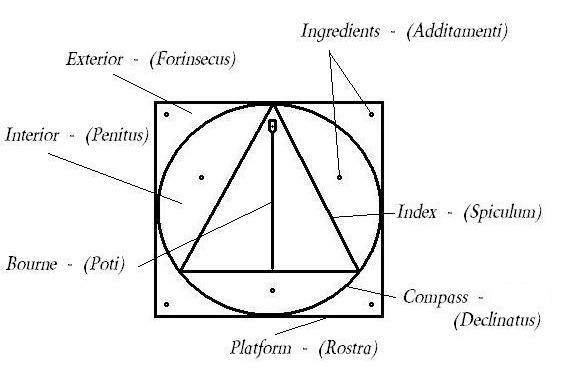 If a Compass is the Focus, it is simply a Platform Set or Elemental Set. Focused Compass Set - This is a Compass with an Index resting. 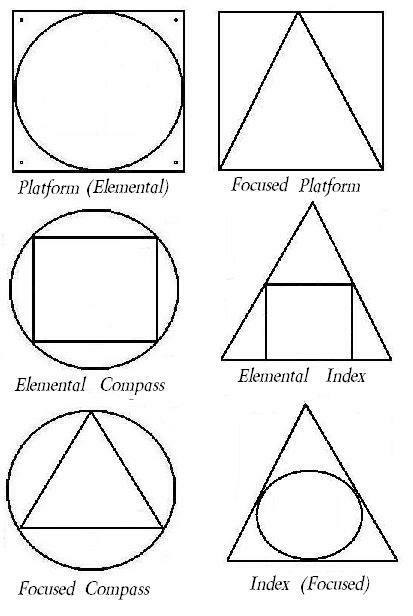 If a Platform is the Focus, it is an Elemental Compass Set. Index Set - Sometimes called a Focused Set. This is an Index with a Compass resting. If a Platform is the Focus, it is an Elemental Index. Again, the same naming conventions apply where the Index point is not north. Using a single Form is known as a Single Set. A set defines the types of Forms but does not mean how many of each Form is used. 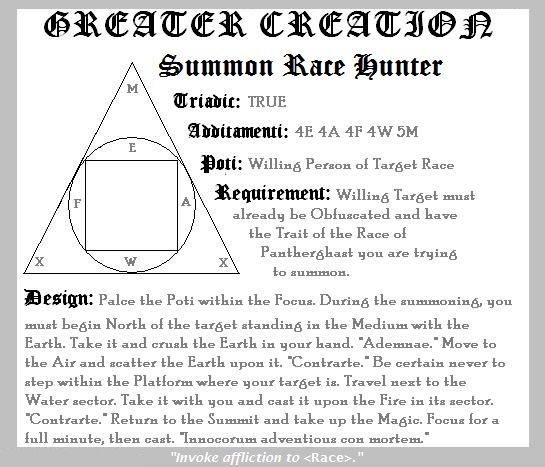 In other words, a Naming ritual which is done using three concentric circles would still be considered a Single Set as it only uses one of the Forms. Below are the examples of how to draw the most common Dual Sets. Designs are the roadmap which lays out how to set up and perform the ritual as well as defines which Sets and Components are required. There are some basic Designs listed here for reference, but most are found in the game. Some are even created by the players themselves. The ritual magic of this world is very detailed and may seem complex, but a lot of it is still experimental. Rituals and their designs are classified as Tripartite, Bipartite and Unique. Most Tripartite rituals use a Triadic Set and take approximately three minutes to perform once the Forms and Components are prepared. Most Bipartite rituals use a Dual Set and take approximately two minutes to perform once the Forms and Components are prepared. Most Unique rituals use a Single Set and take approximately one minute to perform once the Forms and Components are prepared. 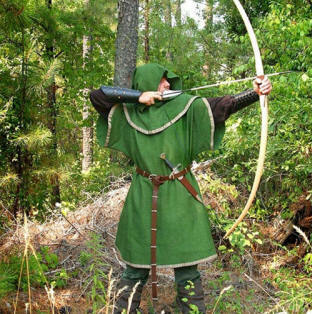 Other LARPs and LARP info found @ LARPlink.com.